No announcement has been made regarding the future of Community, but with two members of its dwindling cast attached to shows officially ordered to series (Ken Jeong’s Dr. Ken on ABC and Fox’s Grandfathered with Paget Brewster), Community feels imminently close to the “…and a movie” phase of its meta prophecy. 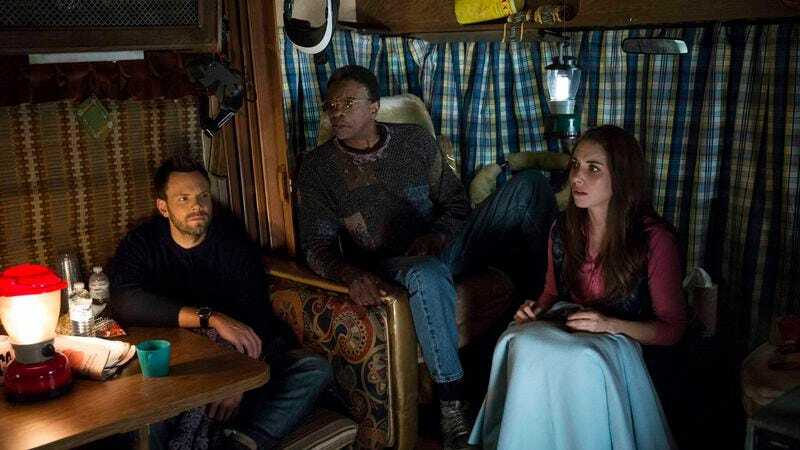 Season six hasn’t been consistent, but some of its episodes have been surprisingly agile and feel nothing like a sixth-year sitcom possibly nearing the end of its run. “Basic RV Repair And Palmistry” isn’t one of those episodes, and not only because it’s pretty light on laughs and a bit listless. “Palmistry,” more than any episode this season, feels like an acknowledgment that the motor home might be running a little low on gas. More than anything, “Palmistry” shows the degree to which Community has lost the diversity of voices that once made it such a fascinating, singular show. In season six, Community reflects the sensibilities of just two of its characters: Jeff and Abed. I’ve been repeatedly caught off-guard throughout the season by how often a line that sounds written for Jeff is spoken by another character, namely Frankie or Elroy. (The phenomenon is especially conspicuous in “Queer Studies And Advanced Waxing,” wherein Elroy gives a cruelly pragmatic speech about the food chain only to be accused of sounding like Jeff.) “Palmistry” is equally skewed, but in Abed’s favor. The use of flashbacks and flash-forwards resulted in a pretty cool and ambitious structure, but it might as well have been “Abed’s Uncontrollable Christmas” given how completely it shifts the narrative to Abed’s perspective. Jeff finally gets fed up with Abed’s “fourth-wall breaking shtick” and tells him repeatedly to knock it off (in the meltdown quoted above), and Annie ends their brief spat: “So now it’s a show about…this?” That line of dialogue rang false the moment I heard it. It just didn’t strike me as something Annie would say, but then again, that’s par for the course in a season largely defined by how hard it is to pin down almost any character other than Jeff or Abed. At ground level, “Palmistry” is also a classically executed (but not classic) Community bottle episode, full of dialogue so densely packed and rhythmic it sounds funny even when there are no actual jokes in it. Because the characters are off campus and trapped in an enclosed space, the episode can’t lean on the rest of the Greendale universe. An episode like “Palmistry” puts a lot of pressure on the cast, and while everyone carries their weight, it’s mostly another showcase for Brewster and Keith David. At this point, I’m ready to declare them even better late additions to the cast than Jonathan Banks was. The problem, though, is even with the addition of new characters, Community feels like its field of vision has narrowed significantly. Dan Harmon’s sensibility is as sound as ever, and Community still boasts some of best sitcom dialogue out there. But the less it feels like a show about characters, the more masturbatory and less vital it becomes. If Community gets a seventh season, I’d like there to be more to it than structural experimentation and more-meta-than-thou winks. I’m such a fan of Frankie now, I’d miss her terribly if the show is renewed without Brewster available to play her. Britta is trying to Britta the term “Britta” by Britta-ing it herself. Again, a phenomenal tag, this time featuring the great Matt Besser.